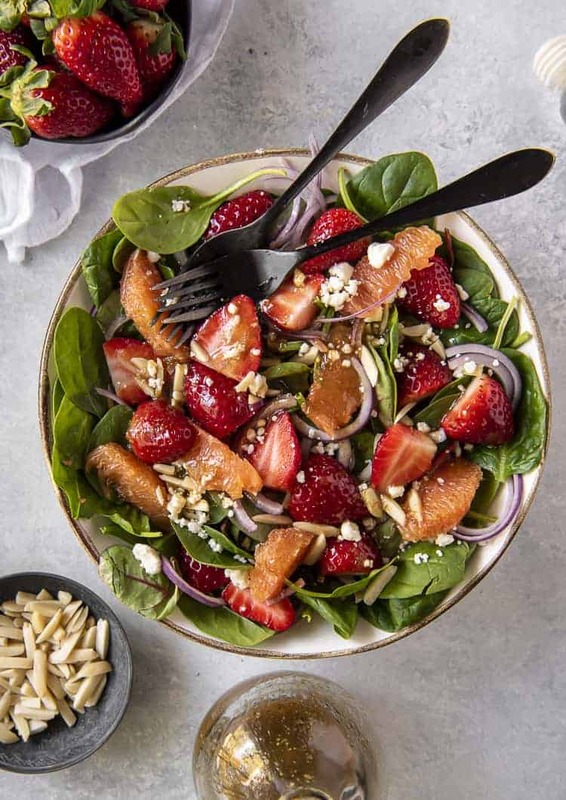 Bright, fresh, and full of flavor, this Citrus & Strawberry Spinach Salad is a taste of spring all year long! 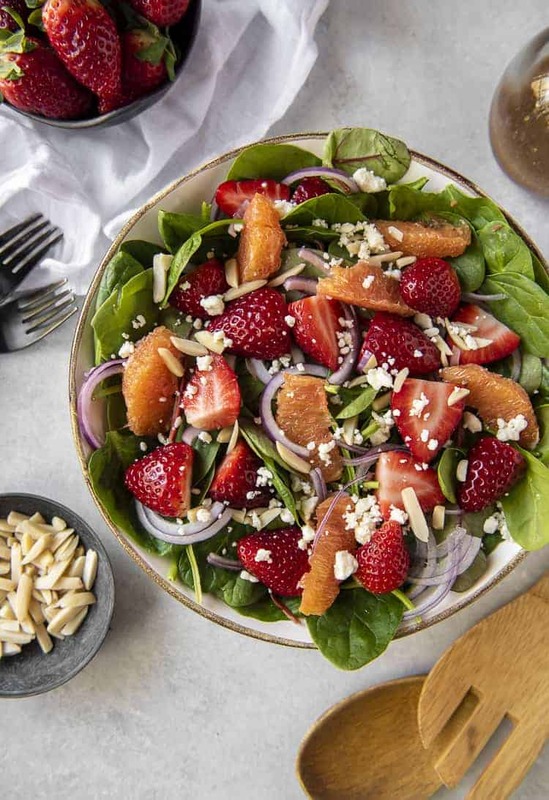 Crunchy greens, juicy strawberries and orange segments, and a snappy citrus vinaigrette make this a perfect addition to any meal. I suppose, considering it’s January, it’s about time I shared a new fresh salad recipe, eh? To be real with you, I am just not a salad person. I TRY. I really do. If it’s loaded with proteins and lots of extras (like my fave chopped salad) then I’m all in. Otherwise, if you see me eating a side or Caesar salad, I’m probably doing it half-heartedly. Is there, like, a class I can take to learn how to love them? Anyway, imagine my surprise when I whipped up this lovely Citrus & Strawberry Spinach Salad…and ended up leaving none for Abe. JUST TAKE ME TO THE STRAWBERRY SPINACH SALAD ALREADY! If you’d rather skip my (pretty darn helpful) tips and tricks, essential cooking info, and similar recipe ideas – and get straight to this deliciously easy spinach salad recipe, just scroll right on down to the bottom of the page where you can find the printable recipe card! Unlike myself, Abe IS a salad person. On the rare occasion that I actually make one for dinner (because we have an abundance of produce, usually), I’ll portion some out for myself and he will devour whatever is left. And usually in less time than it takes me to eat my bit. That usually comes out to 3-4 times the amount I eat. Ridiculous. Since I’m trying to eat better and whatnot, I thought tossing a couple of my favorite wintery local fruits in a giant bowl of spinach and cheese might be a winning combo. Turns out I was right! It might be a salad, but the flavor and texture combo is something I would willingly eat any time. 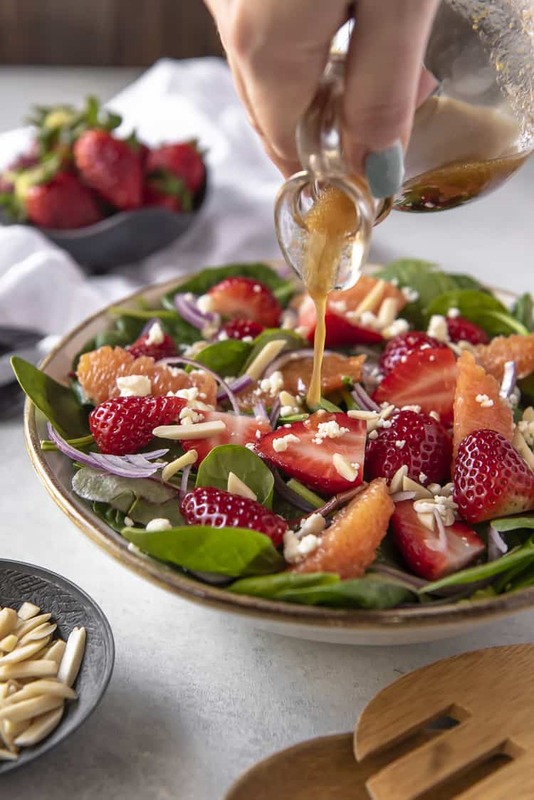 What Dressing Goes With Strawberry Spinach Salad? You don’t even need a blender or anything to mix it up – just shake it all up in a mason jar. You can add a dash of salt and pepper if you’d like, but I thought they might muddy the sharp bright flavors. Alternative dressings (aka store bought) that would also be yummy include a basic balsamic vinaigrette, yogurt-based dressings, or an Asian ginger dressing. 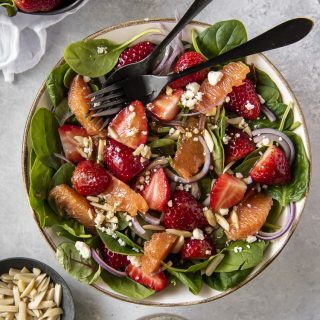 How Do You Make A Strawberry Spinach Salad? Making a salad is one of the easiest things you can do in the kitchen! You literally combine everything in a bowl, toss it with some dressing, and you’re ready to go. Spinach! You could also use a mixed greens blend, as I have here, with baby spinach, baby kale, and chard. 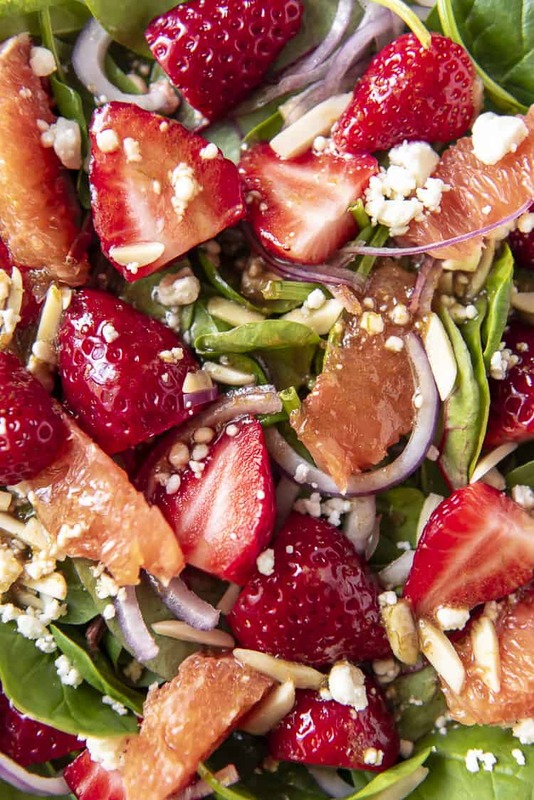 Fresh Strawberries are the undeniable star of this salad. Florida strawberries, in season November through April, are the sweetest and juiciest berries in the world! Be sure to grab them if you can find them. 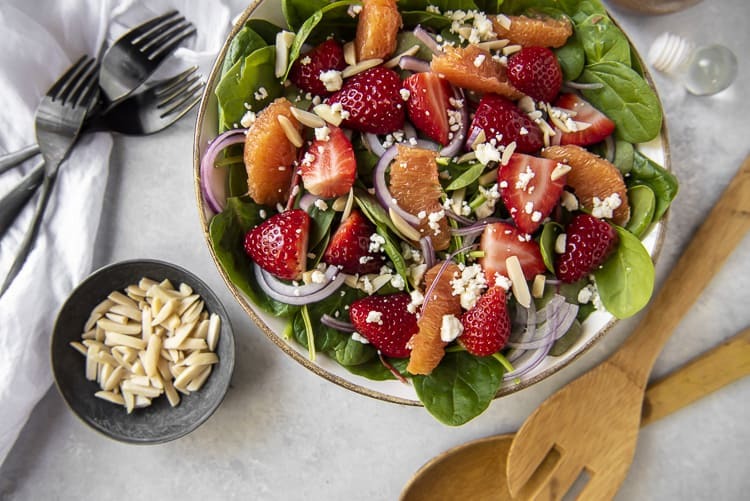 Orange Segments add a tasty pop of flavor to the salad as well. I used Cara Cara oranges because their color is so pretty, but Navels, Blood Oranges, and even Mandarins would be yummy here. Red Onion is optional, really, but adds a necessary contrast in flavor to the sweet fruit. Slivered Almonds. You can use sliced or chopped almonds with the skin on if you’d prefer, and you can even toast them for an extra nutty note. Feta Cheese. Because what’s a salad without cheese? Crumbled goat cheese and shaved Parmesan would also work very well in this dish. And of course, the Citrus Vinaigrette dressing! Lots of citrus juices and zest pair up with olive oil and balsamic for a sweet and tangy topping. Combine all the ingredients in a large salad bowl. Toss and drizzle a small amount of vinaigrette on the salad just before serving. Serve the rest of the dressing on the side and add as desired. Combine all of the dressing ingredients in an 8-ounce mason jar. Shake well until the dressing has emulsified and is well combined. 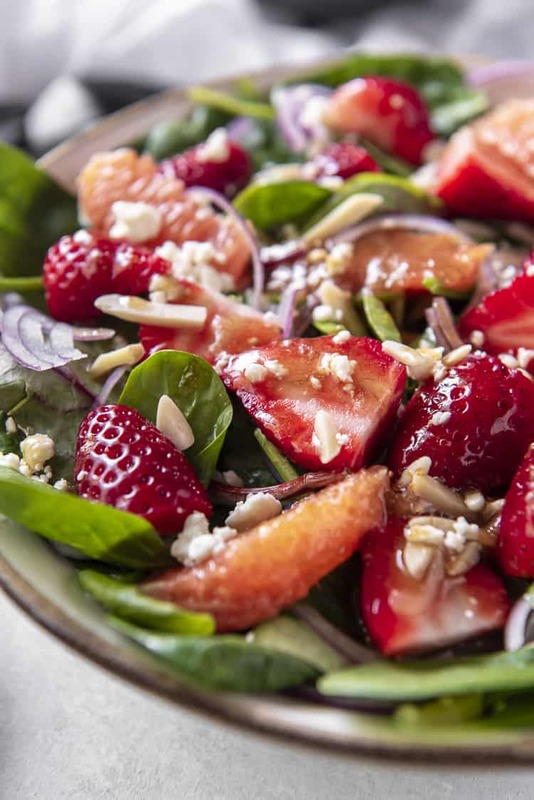 PIN THIS STRAWBERRY SPINACH SALAD FOR LATER!